Toronto is often seen as the city of many cultures, and with different cultures often come different beliefs. I wanted to explore the places of worship in Toronto and determine what areas have the highest concentrations versus the lowest concentrations. As I explored the different ways to display this information in a way that is effective and also unique, I discovered the use of hexbin maps and 3D maps. 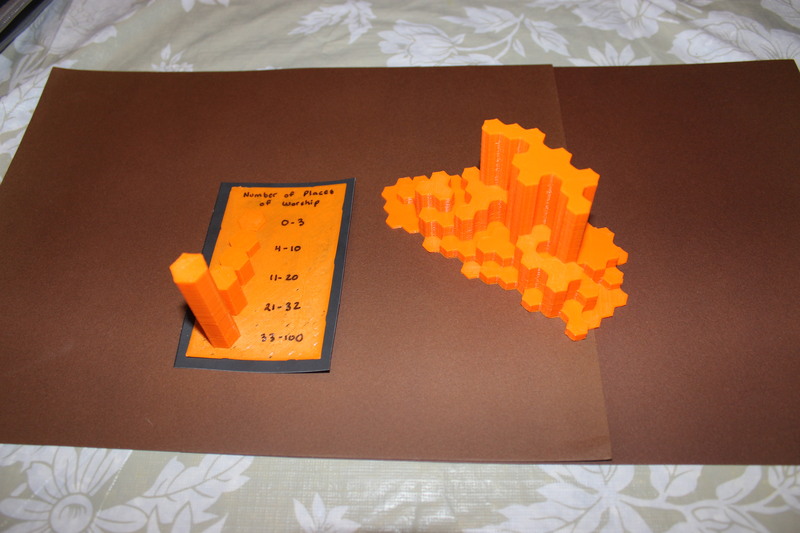 While doing some exploratory analysis, I discovered that while hexbin maps have been created before and 3D maps have been printed before, I was unable to find someone who has printed a 3D hexbin prism map, so I decided to take on this endeavor. 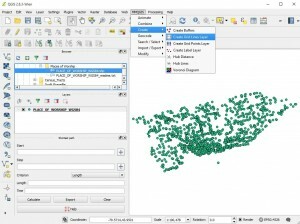 Hexbin maps are a great alternative technique for working with large data sets, especially point data. Hexagonal binning uses a hexagon shape grid, and allows one to divide up space in a map into equal units and display the information (in this case the places of worship) that falls within each unit (in this case hexagon grids). 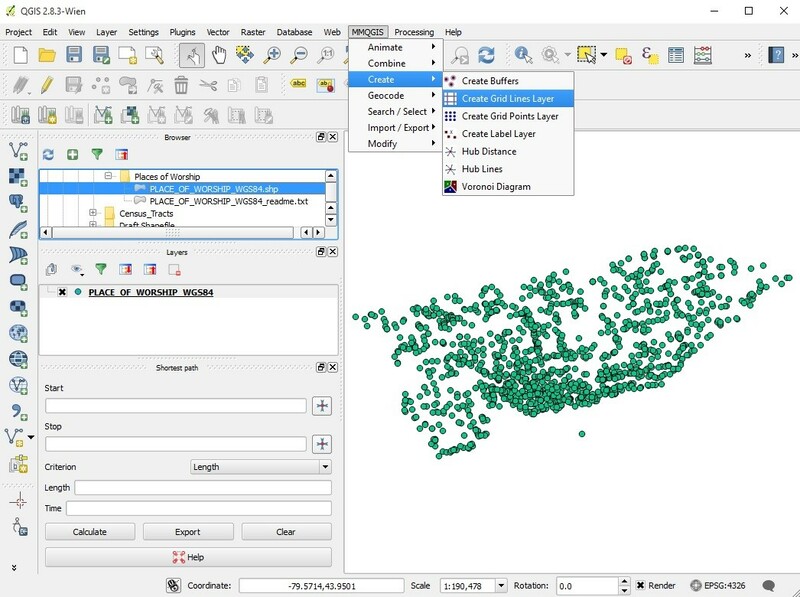 The tools used to create this project include QGIS, ArcGIS, and ArcScene, although it could probably be completed entirely within QGIS and other open-source software. Obtained the places of worship point data (2006) from the City of Toronto’s Open Data Catalogue. Opened QGIS, and added the MMQGIS plugin. Inputted the places of worship point data into QGIS. Used the “Create Grid Lines Layer” tool (Figure 1) and selected the hexagon shape, which created a new shapefile layer of a hexagon grid. Used the “Points in Polygon” tool (Figure 2) which counts the points (in this case the places of worship) that fall within each hexagon grid. I chose the hexagon grid as the input polygon layer and the places of worship as the input point layer. The number of places of worship within each hexagon grid was counted and added as a field in the new shapefile. Inputted the created shapefile with the count field into ArcGIS. Obtained the census tract shapefile from the Statistics Canada website (https://www12.statcan.gc.ca/census-recensement/2011/geo/bound-limit/bound-limit-2011-eng.cfm) and clipped out the city of Toronto. Used the clip tool to include only the hexagons that are within the Toronto boundary. Classified the data into 5 classes using the quantile classification method, and attributed one value for each class so that there are only 5 heights in the final model. For example, the first class had values 0-3 in it, and the value I attributed to this class was 1.5. I did this for all of the classes. The hexagons for the legend were created using the editor toolbar, whereby each of the 5 hexagons were digitized and given a height value that matched with the map prism height. Inputted the shapefile with the new classified field values into ArcScene, and extruded the classified values and divided the value by 280 because this height works well and can be printed in a timely manner. 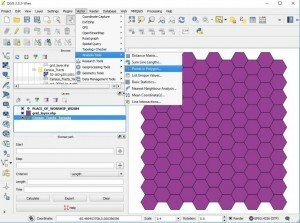 Both the legend and hexagonal map shapefile were converted into wrl format in Arcscene. The wrl file was opened in Windows 10 3D Builder and converted into STL format. 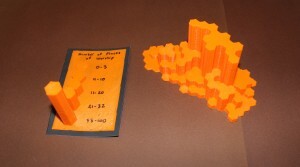 This file was then brought to the Digital Media Experience (DME) lab at Ryerson, and the Printrbot Simple was used to print the model using the Cura program. The model was rescaled where appropriate. My map took approximately 3 hours to print, but the time can vary depending on the spatial detail of what is being printed. The legend took approximately 45 minutes. Below is a short video of how the Printrbot created my legend. A similar process was used to created the map. The final map and legend (displayed in the image below) provide a helpful and creative way to display data. The taller prisms indicate areas with the most places of worship, and the shorter prisms indicate the areas in Toronto with the least places of worship. This hexagonal prism map allows for effective numerical comparisons between different parts of Toronto.